• The difference between the metric and English (Imperial) systems of measurement. • The metric system is used in all Western and industrial nations. • Products sold in the USA are increasingly labeled with metric units. • Every year more factories and repair shops use more metric tools. 1. Why do Americans often use the English (“Imperial”) system instead of the metric system? 2. 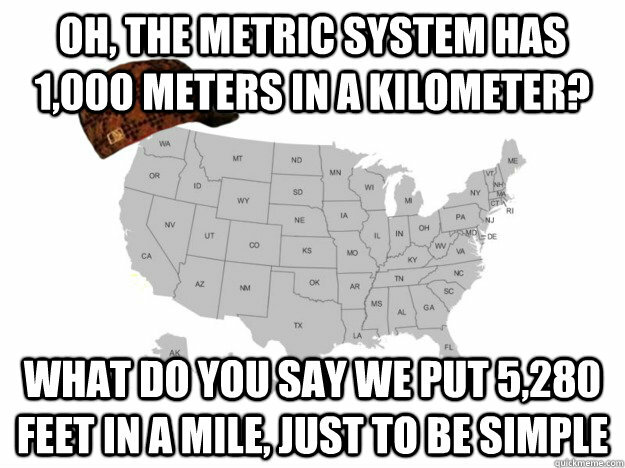 Why did the rest of the world change to the metric system? 3. When would someone need to convert a metric to an English measurement? 4. What could go wrong if someone makes a mistake when converting from metric to English? The Gimli Glider is the nickname of an Air Canada aircraft that was involved in an unusual aviation incident. On July 23, 1983, Air Canada Flight 143, a Boeing 767–233 wide body jetliner, ran out of fuel at an altitude of 12,500 metres (41,000 ft) above mean sea level, about halfway through its Montreal to Edmonton flight. How could they have run out of fuel halfway through their flight?!?! Fortunately, the flight crew was able to glide the aircraft safely to an emergency landing on an auto racing track that was previously a Royal Canadian Air Force base in Gimli, Manitoba. The subsequent investigation revealed a combination of company failures and a chain of human errors that defeated built-in safeguards. The amount of fuel that had been loaded was miscalculated because of a confusion as to the calculation of the weight of fuel using the metric system, which had recently replaced the English (imperial) system for use with the 767. The $125 million satellite was supposed to be the first weather observer on another world. But as it approached the red planet to slip into a stable orbit Sept. 23, the orbiter vanished. Scientists realized quickly it was gone for good. “It was pretty clear that morning, within half-an-hour, that the spacecraft had more or less hit the top of the atmosphere and burned up,” recalled NASA engineer Richard Cook, who was project manager for Mars exploration projects at the time. Ultimately, the Mars Climate Orbiter came within 37 miles of the Martian surface. Simulations showed that, at any altitude lower than 53 miles, atmospheric friction would tear the fragile craft apart. The whole thing could be written off as a miscommunication. Propulsion engineers, like those at Lockheed Martin who built the craft, typically express force in pounds, but it was standard practice to convert to newtons for space missions. One pound of force is about 4.45 newtons. Engineers at NASA’s Jet Propulsion Lab assumed the conversion had been made, and didn’t check. What caused the sinking of the Vasa warship in 1628? Again, people who didn’t do a proper conversion between measurement systems. Vasa set sail on her maiden voyage on August 10, 1628. At the time, she was the most powerfully armed warship in the world, with 64 bronze cannons. Twenty minutes into her journey, the ship was hit by two strong winds. It heeled to port, water gushed in, and the ship sank less than a mile into the journey. Thirty people died. Soon after, there was an inquest that concluded that the ship had been unstable. But the reasons behind the instability have remained a point of debate over the centuries. Hocker’s meticulous measurements gave him fresh insight into what made the Vasa unstable. For one thing, the ship was asymmetrical, more so than most ships. “There is more ship structure on the port side of the hull than on the starboard side,” explains Hocker. No wonder the ship tipped to the port side when the winds hit. But why was the ship so lopsided? While examining the ship, Hocker discovered four rulers the workmen had used. Those rulers were based on different standards of measurement at the time! Two were in Swedish feet, which were divided into twelve inches. The other two were in Amsterdam feet, which had eleven inches in a foot. 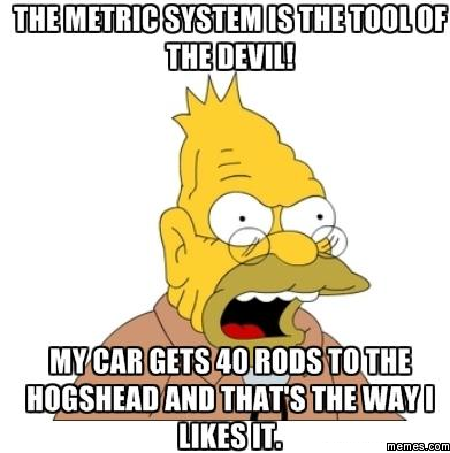 Speculate: (A) What items in your car, school, phone or home might have been designed with metric measurements, and built with metric sized tools? (B) In what jobs today might you be expected to use metric tools? Apply ratios, rates, percentages, and unit conversions in the context of complicated measurement problems involving quantities with derived or compound units (such as mg/mL, kg/m 3, acre-feet, etc.). Students need to develop an understanding of metric units and their relationships, as well as fluency in applying the metric system to real-world situations. Because some non-metric units of measure are common in particular contexts, students need to develop familiarity with multiple systems of measure, including metric and customary systems and their relationships.